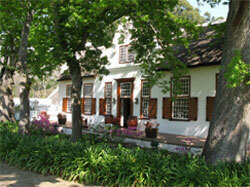 09.00 Pick up at hotel or guesthouse in Franschhoek or Stellenbosch. Start this memorable day with an outstanding sparkling wine - at the House of JC le Roux - made in the Methode Cap Classique. Then on to Rustenburg, a beautiful example of classic Cape Dutch architecture and taste its prize-winning reds and whites. Here you can walk and admire the breathtaking English country gardens created by the owners. A complete contrast is Muratie which belonged to a slave girl and her lover. Here the wines are offered among the old cobwebs and watched over by portraits of a former owner's mistress. The port produced on this estate is world famous. There are many outstanding places for lunch: under the oaks at Morgenhof, the estate of Mme Cointreau of liqueur fame, or perhaps enjoying the breathtaking view of the Banhoek Valley from the modern glass enclosed Tokara Deli, or the typical Stellenbosch cafe, the Blue Orange with its traditional bobotie and salads. Kanonkop is a must. Known for its iconic reds, the visitor will enjoy a cellar tour and meet the winemaker. The cannons at the entrance were used to announce the arrival of ships in Cape Town and the departure of the farmers and winemakers to sell their wares. For the history student a visit to the Stellenbosch museum might be included, or the opportunity to see the classic car collection at L'Ormarins estate, or end the day enjoying a vintage brandy paired with chocolate at the Van Ryn Brandy Museum. Whatever you choose you can be assured of a memorable day out.